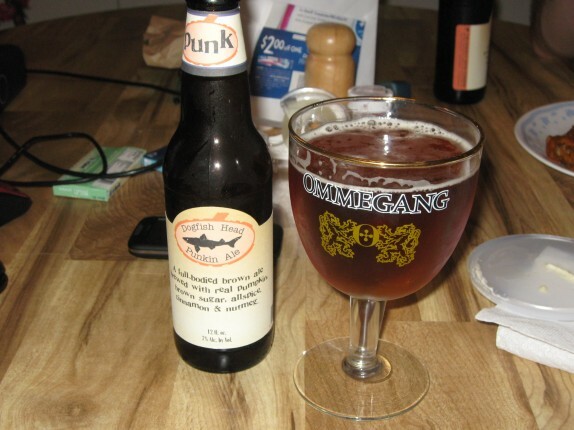 Early in 2010, at the recommendation of John Jordan, I tried a Dogfish Head 60 Minute India Pale Ale. This came with much reluctance because I have never been a fan of IPA style beer or any beer with a decent bitterness; as a matter of fact, in the past, I got into homebrewing and decreased the intensity of the hops used in almost every recipe that I made. As a result of my curiosity, I decided to do the “derryX Dogfish Head Reviews,” and, in doing so, spending a decent amount of money to seek out a number of different style Dogfish beers. Aside from the descriptions contained herein (all of which were copied from www.dogfish.com), all comments are the opinion of derryX. A full-bodied brown ale with smooth hints of pumpkin and brown sugar. We brew our Punkin Ale with pumpkin meat, organic brown sugar and spices [from label: allspice, cinnamon, nutmeg]. This is the perfect beer to warm-up with, as the season cools. First Sip – Somewhat thick on palate. Flavors of brown sugar, pumpkin spice, and alcohol with slight bittering from hops. After you drink it, you taste real pumpkin along with the spices. As You Drink – It never gets heavy. Pumpkin spice flavors never overpower. Always tastes like a beer. As it warms, the brown sugar and malt extract come forward in flavor. Last Sip – Not much different from the first. Sweet, good hint of pumpkin spice, and delicious! Food Pairings – Rotisserie chicken, roasted turkey (i.e. Thanksgiving dinner), duck. Worked really well with pizza and wings. BONUS: While dining at The Judge’s Inn, I had the privilege of trying Punkin Ale on tap. I felt a little crazy ordering it after dropping almost $60 (after deposits) on an entire case, but I’m kind of glad that I did. Directly comparing the bottled vs tap, I feel that the bottled has a deeper pumpkin and spice flavor. I personally prefer the bottled beer (poured into a glass, of course) in this case.